Screwdriver with special thumb grip which gives up 25% more torque, 1/4" magnetic bit holder and ratchet for forward/reverse and lock. 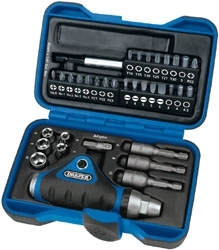 The set comprises 24 insert bits, three nut runners, five 1/4" square drive sockets and 60mm long magnetic bit holder. Display packed.